Finally we have returned from the BBQ at John’s, and this time we got the right weekend, lol. Because I met John last weekend, that meant the only people there I was yet to meet was Keyla and the rest of Vicki‘s family. Sigma, Vicki, Janne and Rien I had met previously when I came to The Netherlands last time. It was a wonderful relaxing time catching up. Lots of booze was drunk, except for myself and Vicki (and the kids, lol). Friday night started off with dinner, then BODYSTEP at Shape. Vicki, Rien, John, Keyla, Alexander and myself did step followed by a late evening drinking and talking. I went to bed about 3.30am which left John, Sigma and Alexander still talking. As we had to get up early the next morning for balance, that left John with about 2 hours sleep, Alexander with 1 hour sleep and Sigma with none. Needless to say many of them ended up having a snooze the next afternoon. I only did Balance at Shape in the morning, although some of them also did Pump. In the evening we kicked off the BBQ with some others from John’s mensa group arriving. It was hot (which loved but everyone else hated) and then thunder and lightening came followed by plenty of rain. 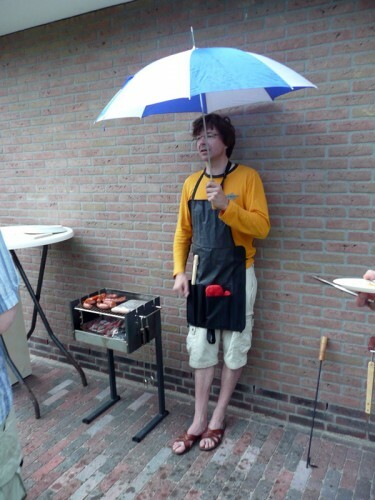 John was left standing in the rain cooking the BBQ with an umbrella. Sunday was a late breaky, shopping (I bought a nice bag at the Nike outlet, woohoo) and dinner at a Turkish restaurant. Since they only had dutch menu’s……I relied on Alexander to choose a couple of dishes I might like and translate those for me. I ended up having a REALLY yummy meatball dish that was also REALLY REALLY hot. I do like hot food, and I can handle a fair bit of chilli, but this dish certainly challenge the tolerance of my tastebuds for fire (I hope Connor likes spicy food, lol). Finally we said our goodbyes and drove home……….this time with all our headlights. It was sad to say goodbye, but this time I know I’ll definately see everyone again!